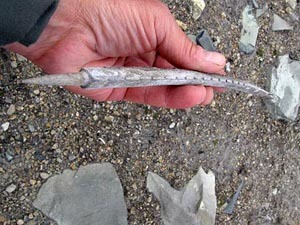 Antler arrow point found in ice patch in Lake Clark National Park and Preserve. Sub-alpine landscapes where ice patches are found are now silent and rock-strewn, where low-lying scrub and lichens are the only vegetation in sight. But the objects that ice patches contain can be silent reminders that forests sometimes stood here, and animals and people found reasons to make the climb. What was so attractive about these high places? The ice patches are part of the answer. When winter snows accumulate in places like the lee of windblown boulders, the snow can become thick enough to withstand summer temperatures. Over the years the old snow stratifies into layers of low-density, sometimes porous ice. In summer the ice patches provide a trickle of water, as well as tender young plants. They also offer a cool refuge for hoofed animals fleeing biting insects. Human hunters follow the animals. Unlike glaciers, ice patches don’t move—so anything that falls on top of an ice patch can become encased and frozen, including fallen trees, fragments of lighter vegetation, animal dung, the animals themselves, and even artifacts discarded or lost from human hunters, gatherers, and travelers. 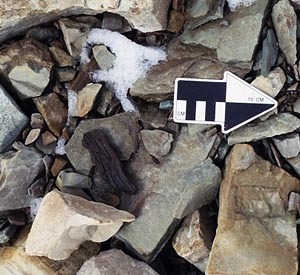 Ice Patch Archeology Team member Rachel Reckin discovers wood fragment at Glacier NP ice patch. Photo by R. L. Kelly. Many of these ice patches are on mountains within the boundaries of America’s national parks. Parks are refuges for America’s natural and cultural heritage, and also ideal research contexts for learning about interactions between climate, ecosystems, and human beings. When climates warm up, like today, high mountain temperatures go from cold to mild. Trees slowly colonize what was once high elevation scrub-land, and lowland animals track these habitats upslope for food and habitat. People tracked those important resources up the slopes too. When perishable remains of lowland plants and animals are preserved in ice patches, they offer traces of ancient climatic warming episodes that slowly drove lowland habitats upward. An interesting pattern is emerging globally: most archeological material recovered in ice patches from much of North America and Norway relates to hunting, while finds in the Alps and British Columbia are primarily connected to travel over mountain passes (many readers will recognize Ötzi, the Neolithic man who was murdered some 5,000 years ago in the Italian Alps). Items found in South American ice are primarily related to sacred activities. Recent discoveries in Wrangell-St.Elias (Dixon, Manley, and Lee 2005), Rocky Mountains (Lee and Benedict 2012), and Yellowstone National Parks (Lee 2012) have produced spectacular and unique archeological materials such as atlatl darts and foreshafts, as well as paleobiological specimens, e.g., animal remains or feces, frozen trees, and other naturally occurring items dating to before 7,500 years BP. Higher temperatures also endanger ice patches and the delicate contents within. Shorter, warmer winters with winter rainfall events erode ice patches quickly. Once organic items become exposed, there is a short window of time before their irrevocable loss. If exposed items are not removed by animals or stolen or disturbed by park visitors, then they will deteriorate; an arrow's fletching, for example, becomes detached within a year of exposure, sinew shortly thereafter. According to ice patch archeologist Craig Lee, wood deteriorates in four or five years, and bone or antler within ten years. Because the NPS is charged with stewardship of the material traces of our natural and cultural heritage, it is our responsibility to minimize the loss of these items. And because parks are ideal places to learn about natural systems in a relatively non-disrupted state, researchers have an opportunity to work with specialists in many fields. Native American communities and traditional experts, scientists, and agency managers all have a stake in protecting and learning from the emerging contents of ice patches. Ice Patch Archeology partners include researchers and experts from the University of Wyoming, Confederated Salish and Kootenai Tribes, University of Colorado Boulder, Blackfeet Nation, University of Arizona, Glacier National Park, and the Rocky Mountains Cooperative Ecosystem Studies Unit. Photo by Ira Matt. As of 2009, Glacier National Park, with iconic glaciers melting at an alarming rate, had not undertaken any surveys of its ice patches. That winter a multi-disciplinary team of tribal experts, university researchers, and park managers stepped up to the National Park Service’s call for climate change-related research applications with an ambitious proposal to survey, map, protect and, if necessary, collect and curate cultural and paleobiological items from the park’s ice patches. The proposal was unique in calling for development of culturally-informed documentation, handling, and collection protocols in full partnership with tribal experts from the Confederated Salish and Kootenai Tribes of the Flathead Reservation and the Blackfeet Nation, whose aboriginal territory includes what is now Glacier National Park. Both nations have strong cultural, economic, and spiritual ties with Glacier’s mountain landscapes. The research literature and oral histories indicated that cultural items, if found, could span a time period from thousands of years ago up to the recent past. In addition, some items in ice patches might be subject to the requirements of the Native American Graves Protection and Repatriation Act. The team agreed that direct engagement by tribal experts in the planning process and in the field would prepare for a variety of possible discoveries and meet the requirements of good cultural stewardship as well as scientific investigation. The project team includes members of the Confederated Salish and Kootenai Tribes of the Flathead Reservation, the Blackfeet Nation, the University of Wyoming, the University of Colorado Boulder, and the University of Arizona as well as Glacier National Park’s cultural resources program and the Rocky Mountains Cooperative Ecosystem Studies Unit (CESU). The proposal was fully funded in 2010 and implemented through the Rocky Mountains CESU: the only cultural resources project supported that year by the National Park Service’s Climate Change Response Program. To investigate and document ice/snow patches in Glacier National Park in order to identify archeological, ethnographic, and paleobiological resources endangered by recent climate change and to recover archeological and paleoecological data relevant to global warming research. To work collaboratively with the Confederated Salish and Kootenai Tribes of the Flathead Nation and the Blackfeet Nation to develop and implement culturally appropriate protective and conservation measures for sensitive cultural sites, features, and objects at risk from snowmelt. To enhance cultural resource stewardship and protection at Glacier National Park through public education and interpretation about climate change impacts on cultural resources and resident indigenous communities, using state of the art media techniques. To develop a strategy and methodology for assessing and mitigating impacts to cultural resources from glacial and snow/ice field recession that can serve as a model for other parks, agencies and entities in the United States and throughout the world. Another trend-setting characteristic of the Glacier Ice Patch project is its interdisciplinary nature; the research will blend together archeology, traditional knowledge, ice science, zoology, and botany toward a holistic understanding of the science and cultural heritage of Glacier National Park’s ice patches and the unique sub-alpine mountainscapes where they are found. the patches can be seen on aerial photographs from 1998, the warmest year in recent times. This last criterion indicates a high likelihood that the ice patch has persisted through prior warm years. The project team identified several target ice patches by examining historical documentation including aerial and satellite images from the park and the U. S. Geological Survey. In conjunction with the University of Colorado Boulder’s Institute for Study of Arctic and Alpine Research, the team removed effects of image perspective and terrain to remove distortions from the photographs and put geographical information into Geographic Information System (GIS) format. This allowed data about the target ice patches to be input to Global Positioning System devices, so that field teams could walk relatively easily to target ice patches. This is important in the rugged, remote landscapes of Glacier National Park, where extreme weather shifts can happen in minutes. In three field seasons, no human-made artifacts have yet been found in Glacier National Park ice patches. But an array of paleobiological discoveries has enormous potential to inform our understanding about ancient climates and ecosystems, as well as the ways that these systems transformed over time. They are listed by category below. Wood fragment possibly indicating ancient forests during a prior warming period, in what is now the sub-alpine zone. Photo by R. L. Kelly. A variety of trees are represented by wood fragments found in or near Glacier’s ice patches. Collected specimens include yew, western larch, Douglas fir, and pine (possibly white pine). Radiocarbon dates vary widely from 160 +/- 40 BP to 5300 +/- 40 BP (both yew specimens). A cluster of dates in the 900-1300 BP range dated the Douglas fir, larch, and pine species as well as yew. Wood can be deposited in a number of ways, including transport by large raptors for nesting material. If the fragments were transported then they are less likely to be indicators that trees once stood in these locations. The team evaluated known golden eagle nest locations using Glacier NP data, and none of the currently known nests are near any ice patches that yielded wood fragments. Also, the team is documenting whether fragments are likely to be roots, a better indicator that the tree actually grew nearby. More wood samples are currently under analysis. 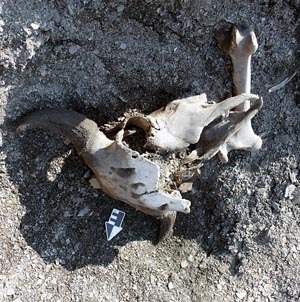 Bison cranium and femur found downslope of ice patch in 2012. Photo by R. L. Kelly. 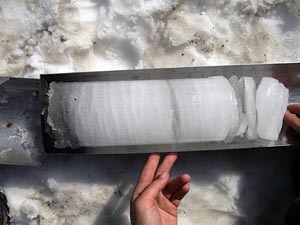 Ice Patch core showing melting episodes and organic layers. Photo by R. L. Kelly. The Glacier Ice Patch team has pioneered, with the assistance of the U.S. Ice Drilling Design and Operations Program at the University of Wisconsin-Madison, a new technique for obtaining cores from the unusually porous ice found in sub-alpine patches. In 2013, the team collected several samples from an ice patch near Siyeh Pass (elevation 8,080 feet) near Mount Siyeh. Thin dark layers of organic matter composed of windblown dust, animal feces, and possibly volcanic ash, are indicative of warming periods when melting layers ‘lagged’ or collapsed on top of each other. The dark layers were sampled by documenting the intact layers, melting ice samples, straining the resulting water and organic materials through fine mesh, and packaging organic materials in the field. Results identifying the composition of the organic paleo-biological material and their age are pending. While the Glacier National Park project has not yet located any cultural items, the ancient history of Native occupation of these lands and the large number of ice patches yet to be examined indicates that it’s a matter of time before cultural objects are exposed. In the Greater Yellowstone Area, a unique discovery recently came to light: an atlatl dart shaft that dated to more than 10,000 B.P.—a late Paleoindian-age artifact frozen in time. So the likelihood of future finds in Glacier is high, and the park is scoping options for routine monitoring of the highest priority ice patches. The Glacier National Park project is a flavorful blend of academic, tribal, and Federal participation. It is the only ice patch-focused research in the Service that has direct tribal involvement in all phases. 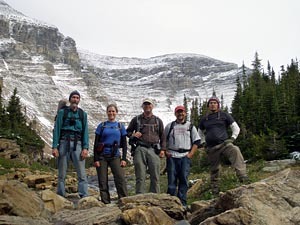 In addition, the Ice Patch team has been such a successful model for collaborative project planning and execution that Glacier National Park intends to continue to work closely with team members on future cultural resources activities under the newly formed Glacier Cultural Resources Management Group. This project is full of timely and fascinating themes and concepts ideally suited to a variety of audiences. The team has already produced a youtube video with the assistance of the Salish-Kootenai College, and an interactive website is under construction. The website will feature special pages with targeted content for teachers, kids, scientists, and managers as well as a ‘general interest’ welcoming portal. The objects found and lessons learned from Glacier National Park’s ice patches. The project was recognized nationally in 2012 by the Department of the Interior with the Secretary’s Partnerships in Conservation Award. Glacier National Park and the Rocky Moutains CESU will work with Intermountain Region and Washington Office cultural resources programs to disseminate the culturally sensitive field and lab protocols as a transferable example to other parks and even other agencies. Glacier National Park has always been iconic for its beautiful mountain landscapes, and is now unfortunately the ‘poster child’ for climate change-related losses of glaciers, ice patches, and the values associated with alpine and sub-alpine landscapes, ecosystems, and heritage values. The Glacier Ice Patch Archeology and Paleoecology project has yielded scientific and cultural information about past climates and cultures that can inform resource stewards as well as capture the public imagination. In particular, the project team hopes to bring young people and Native communities to the table in tackling climate-change related warming and finding learning opportunities in the midst of discouraging losses. Hopefully this project will ultimately be of interest to First Nations and other indigenous peoples globally whose heritage is being affected by climate change, as well as academic and public land managers abroad. 2012 Withering Snow and Ice in the Mid-latitudes: A New Archaeological and Paleobiological Record for the Rocky Mountain Region. Arctic 65(Special Issue):165–177. 2012 Ice Bison, Frozen Forests and the Search for Archaeology in Colorado Front Range Ice Patches. Colorado Archaeology 78(1):41–46. By Pei-Lin Yu, Craig Lee, Robert Kelly, Ira Matt, Francis Auld, Kevin Askan, John Murray, Maria Nieves Zedeno, Frank Tyro, David Rockwell, Lon Johnson, Deirdre Shaw, and Mike Durglo, Sr.